by Dave from The Longest Way Home ~ November 12th, 2013. Published in: Travel blog » Philippines. Tonight a second typhoon is due to hit Surigao province in Mindanao. Mere days after Super Typhoon Haiyan (Yolanda) hit devastating the provinces of Samar and Leyte to apocalyptic proportions. It will not stop there either. This is Typhoon season in the Philippines – at least that’s what I called it when I was living there. From now until January Typhoons and flash floods will continuously hit the island nation. I’ve seen and lived through many while living in The Philippines and I’ve seen the best and worst in people as a result. Very little usually makes mainstream media attention. The fact that Haiyan was one, if not the, largest Typhoons of all time promoted it in the medias eyes. Now the sheer apocalyptic scale of devastation it’s left this largely ill prepared nation means it will stay with us all for a very long time. I’ve received several emails from readers wanting to know how to help Filipinos affected by the typhoon. Many write with good heartfelt intentions but with ideas that simply will not work. 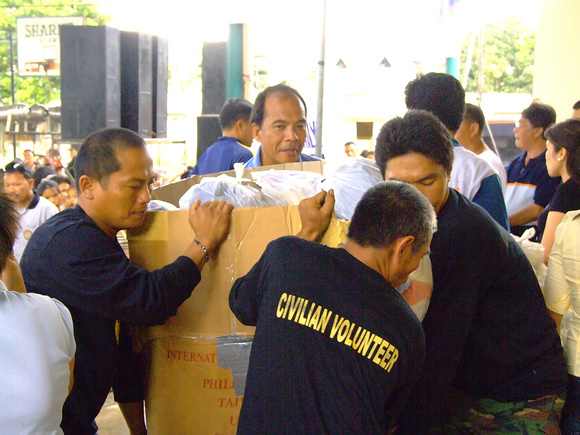 Many want to send physical food, medicine and clothing to The Philippines. Please do not! Disaster management is already into full swing in The Philippines from both national and international agencies. What’s more rural Filipinos have their own diet and nutritional needs. Sending regular cookies, dried milk, protein bars etc will not help. It will hinder. Aid organisations have their own sources of proper food that’s specially prepared for disaster relief. Yes there are people who have lost everything in the affected areas. But there’s plenty of clothing within The Philippines and nearby nations that is far more suitable to the climate. What’s more clothing is relatively cheap in The Philippines and is far more accessible than sending a carton of clothing from half way round the world. Sending bottles of aspirin is little good when what’s needed in a certain area are mosquito nets. Sadly I’ve seen a steady rise in despicable people quickly cashing in after a disaster by asking for direct donations to help local communities. Unless you know the organisation and know where the money is going then don’t send a penny. And that’s already being provided by highly trained national and international organisations. 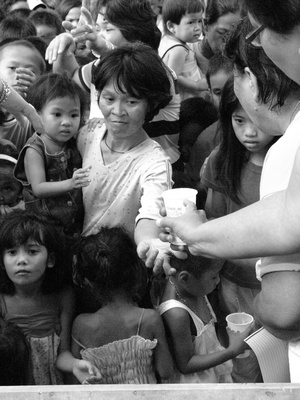 It is these organisations that need help to continue their efforts in The Philippines. Volunteers are needed. But only highly skilled and qualified volunteers. I’ve seen and experienced countless “NGO’s” and “charities” over the years ask for foreign help for The Philippines. These are the type of organisations who request to be paid by the volunteers to volunteer. Many volunteers are then flown over to The Philippines to help clear mud or help build local houses. Sorry if this offends anyone, but there are more than enough local people in The Philippines who are more than qualified to shovel mud or build houses. What’s lacking in The Philippines right now are people who have experience and qualifications in emergency services, disaster management and medicine. After that will come engineers, architects and sustainable disaster relief specialists. Flying into the Philippines right now to volunteer and not knowing what to do other than “to help” will result in you causing more problems than of being a help to anyone. Send money to the right organisations. It will not give you the feel good factor that so many crave when trying to help a nation or people in need. But the big aid organisations that are currently out there in The Philippines are the ones that need help now and in the coming months. They are there now. They first carried out a disaster assessment of the area. Today they started sending out field teams to the worst hit areas. Over 329 tonnes of medical and relief items are already on the way. Including fresh water, a floating hospital, tents and medical aid equipment. Both are sending medical and communications experts to The Philippines. Emergency aid tents, hygiene kits, kitchen utensils, jerry cans, tarpaulins, water bladders and water-treatment units, emergency latrines and medical supplies. UNICEF already estimates that over 4 million children have been effected by Typhoon Haiyan alone. They are there helping now. Already at work in Bohol after the recent earthquake the World Food Programme is running short in supplies. They’ve sent 44 metric tons of high energy biscuits to the worst hit areas of the typhoon. They need help to send more food to the worst hit areas. Are there other national and international aid organisations helping? Yes. Likewise local organisations and companies. I cannot speak for them though – just the ones above. Again I strongly advise anyone wishing to help to donate money not items. And if you are donating money make sure it’s going to the right organisations or to organisations you know and trust. As I wrote at the beginning. Tonight (12th November) another Typhoon will hit Mindanao. It’s nowhere near the strength of Haiyan however it is being deeply feared for carrying a lot of rain water. Flooding is expected. These will not be the last of the Typhoons this year in The Philippines. In the coming months people will rebuild their homes or relocate into new accommodation. I’ve been there and seen this. The travesty is in rebuilding homes people are using old building methods and materials. 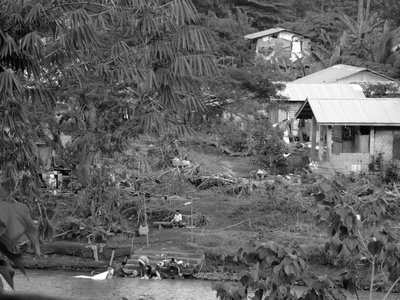 Wood and corrugated tin roofs are the mainstay for housing in The Philippines. Why? It’s cheap. The problem is they will only last until the next typhoon, flood or earthquake. If using these methods to rebuild home then later this year or next year expect these same people to lose everything again. Is the Filipino government doing enough to help its own people? While the Philippine government is under criticism for its lack of readiness for Haiyan the fact of the matter is they did start the evacuation of several hundred thousand people in advance. If they had not then the death toll might have been worse. The real let down from the government is that this happens nearly every year and little is done to stop this repetitive cycle. The Philippine Government will no doubt promise with one hand to put measures in place to help prevent disasters like this in the future from having such devastating effects. Just like they have promised in the past. Then with their other hand they will ask for aid money to do this. The levels of corruption and incompetence at national and local government offices in The Philippines means so many people will be pocketing the aid money very little will ever get done that was promised. This really has to change otherwise there’s little point in being hopeful for the future. Aid organisations need to get tougher on the government’s accountability. Transparency of accounts and quantifiable reports are needed from beginning to end. Moreover the Filipino people need to see where all the international aid money, given to their government, to help them is going from start to finish. 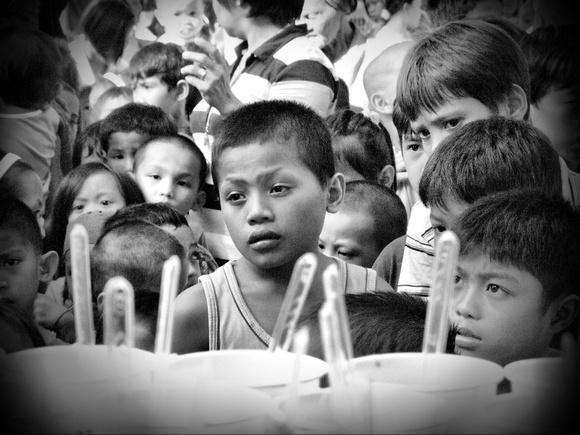 Future proofing the Philippines from natural disasters begins with education. It’s infuriating to witness people lose everything in a flash flood and then a few months later move back in with no preventative or survival measures taken. Then the following year or two it all happens again. Future proofing the Philippines from future natural disasters means educating not just children but also adults in what to do during a flash flood, typhoon or earthquake. So many simply do not know what to do. From simple things like knowing how to swim, having spare batteries or torches in plastic bags, spare tinned food and water to knowing where the emergency aid buildings are in the local towns. Yes, people will argue this is a poor nation with other priorities. But a lot of the above can simply be taught in schools in under an hour per month. Make it a part of the national educational curriculum. Communities can begin to work on helping themselves there after using sustainable methods. Rather than waiting for handouts after the next disaster strikes. The world does not need another nation that just waits for handouts after every disaster. The Philippines is more than this. The Filipino people are more than willing to learn if only they are shown how and what to learn! If you’ve ever been in The Philippines during an earthquake, typhoon or flood you’ll know that getting facts is near impossible. When I was in The Philippines I got most of my information from Japanese earthquake centers, USA early weather watching tools and social media. Weather stations in The Philippines are a joke. Likewise disaster management communications and early warning systems. Why for instance are their two names for the same typhoon in The Philippines every time one enters the country? A local name and then an international name (Haiyan/Yolonda) thus confusing matters even more. But perhaps worse than all this is the lack of clear factual information. I’m reminded of a time when a local major sent panic of an impending Tsunami after an earthquake by going on the radio. It turned out it was a burst pipe on a road. But it made people panic, which is bad. The reality was there was no Tsunami watch in place. Perhaps worse than this was that the people did not know what to do in the event of an impending Tsunami other than pray. It would be a milestone in world development if the rebuilding of houses in The Philippines could be done with an initiative in concrete or materials more durable than timber or tin. Yes it’s more expensive to use these building materials but that’s what the aid / grants would be there for. At the end of the day a properly built house with a deep foundation made of durably strong materials with a proper heavy roof built above flood levels will do a lot better in a natural disaster than what’s currently being built. Simply putting up cheap wood-paneled housing again will mean in the next two years we’ll see more deaths and devastation like this again. Rebuilding disaster prone areas of the Philippines properly and re-educating people is no easy or cheap task. It is a huge project. But unless something like this is done we are looking at more disasters like this in the future. The storms, typhoons, flash floods and earthquakes are not stopping. No amount of praying or wishing will prevent more disasters from happening. While educated people and strong housing will not completely prevent all disasters they will certainly help more than repeating the current methodologies. What we are witnessing now is a calamity of apocalyptic proportions. It’s important as humans to help each other in these times. It’s also important to help people from facing the very worst of these disasters in the future. Tonight another typhoon hits the south of The Philippines. People are worried and scared. If proper measures are put in place then people would be less scared and fewer people will be affected. It’s no easy task to change a nation’s attitude. Filipinos are a proud and resourceful people. If they can focus on future proofing their nation as much as possible from these yearly natural disasters then they’ll surely be less vulnerable than they are now. (previous post) « What would it be like to live in Nepal? Thanks a lot for publishing this Dave. We really appreciate it. Your words could not be truer. We need help, real help from the international community. Even our own military has been hit by this. Prisoners are on the streets. They broke out of prison into a worse one. I read about the prison break. Things are bad at the moment. I’m sure once troops actually move in things will get better. At the moment it’s logistics which is hampering things. There’s so much news about this but I don’t understand if it’s just these regions that have been hit or if the whole country is in trouble? It’s not the whole of The Philippines, just the central part and more specifically the central eastern region. The provinces of Samar and Leyte were worst hit. The rest of The Philippines was fine. Where do you think this material for building concrete houses will come from? I’m sure there’s better building material in the Philippines than just wood. We have nothing in this country nothing!! Why do you think we suffer like this! @ Jose V.A Easy there. You might want to dig around a little on what there actually is in The Philippines here’s a list of mining communities in The Philippines. Now here’s some information about illegal mining in The Philippines. And here’s more about illegal mining. Here’s a map of all the mineral wealth in The Philippines. So that’s minerals. Now on to concrete in The Philippines. So there is mineral wealth (just one sector of a sample). And there is concrete … but what’s messing it all up? The Philippines and Filipinos have all the potential in the world. Including your own resources. It’s really up to Filipinos on how to handle it. Terrible things happen with climate change. Every year the USA seems to get battered too. If they can’t manage is there any hope for a country like The Philippines? Good point Craig. No one ever said the USA had all the answers. The Philippines get far more Typhoons and storm damage than the USA. Much like the Spanish who paint their houses white to deflect the suns heat. Or the Moroccons who have flat rooftops that act to reduce heat, capture rainwater and be used as a work area. People adapt to their environments as much as possible. Climate change is here. We are living it. I believe the Philippines could be at the forefront of designing Typhoon resistant housing. I’m not saying it will stop anything on the scale of Haiyan but it would certainly reduce the amount of carnage we are now seeing. If not building, then at least improve the early warning systems, disaster recovery and emergency crews. Thank you, thank you, thank you. Kindness comes back to those who give. Nothing will stop our nation from recovering from this! Nothing. Thanks Peaches. I think you nation will recover though! Great post! People always want to give “stuff” to help, and I totally understand that, but you’ve laid out all the reasons why that’s not always the best way to go. I especially like your point about donating to proven organizations already on the ground there. I think it’s a human trait to want to give what we have to hand to people in need. But the Philippines is halfway across the world with different needs to people on the other side of the world. These organisations ask for money rather than items for a reason. Thanks for putting all this together. I see there’s not just work to be done in the Philippines but all over the world to prevent disasters from having such devastation on places like this. We need to have a better worldwide disaster system in place. Who is coordinating all this? As far as I know The Philippines is coordinating where all the aid goes and how it gets there. I don’t think this is the best way to go about things. But Aid organisations aren’t equipped to distribute or link up with other organisations on a scale like this. One of the main problems of development work is indeed too many organisations all trying to do something and not working together. So yes, I do think it might indeed be better for one united emergency aid organisation to do the logistics in such a case as this. The biggest issue is working with Governments who are either too inept, ill-educated, ill-advised or who are simply too proud to accept someone else taking over what they see as their job. Thanks for this post. My countrypeople in Tacloban are suffering. Hopefully corrupt politicians will keep their dirty hands off the aid that’s now pouring into my country. Fortunately, I don’t have any family there, but the town has been totally devastated and really needs massive help. I hope they don’t get their hand directly on any money either. What’s happening now from what I’ve heard is that logistics is turning into too big a job for the Gov to handle. So there’s all sorts of mistakes being made. If only the UN or the like could just take over the complete operation for now. If those people believe that they have to leave the area for the warning with the upcoming storm, there should have been no casualties, but they don’t leave their properties because they more endeared in to material things. Another reason why better housing and food will always remain expensive in Phils is because of a severe shortage / lack in our country of indigenous industries and manufacturing units. Nearly everything is imported – especially from USA / China / Australia and Japan. It is only when we Filipinos ourselves will start setting up our own factories that things will start to change. Shopping malls are not a symbol of development – basic infrastructure, housing and education are, all of which we lack.